Michael Gula's analyzes on "The Zappa Album"
In itself, playing modern music on ancient instruments is daunting, but playing Zappa on them increases the challenge manifold. I don’t know how it happened, but the musicians on this CD rose to the challenge and succeeded – certainly beyond wildest expectations. I could actually hear my own heart pounding as I listened to portions through headphones. 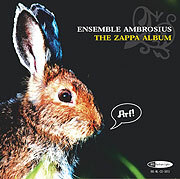 The disc is a triple triumph (1) in performance, (2) in transcribing, (3) in adaption: In performance, the musicians navigate the tricky Zappa melodic lines with aplomb and flair. In transcribing (since the liner notes say that the sheet music wasn’t used and I belive them), I can hear the work of guyswho can really hear those subtle Zappa melodic and harmonicnuances and write them down. No septupleted demisemiquavers in this Alien Orifice, no sirree Bob! We got the realdeal! In adaption, I can hear the musicians translating rock music thuds and chrunches into equivalent effects on baroque instruments. Reading this, you might be thinking that the resultant effect would be a succession of groaners. Take my word: there are no groaners here. I can recommend this one without reservation. In fact, you might even decide it would make an ideal holiday gift. If there is such a thing. Printed with the premission from the author.